One of the things I love about being at home is my view of Toronto – I live on the east side of downtown, and my view faces west. In my building, I have the urban view – all the high rises, while my neighbours across the hall have the lake view – seeing the edge of Lake Ontario and the residential neighbourhoods that stretch east along the lakeshore. I’ve always loved that my view changes – there’s been a plethora of construction in downtown Toronto – and its interesting to see the new glass boxes – I just wished they were a bit more distinct in their design. But it wasn’t until recently that my view has changed and its now something that really struck it for me. When I started this blog three years ago, I was joining the millions, hoping to share my view of our world. 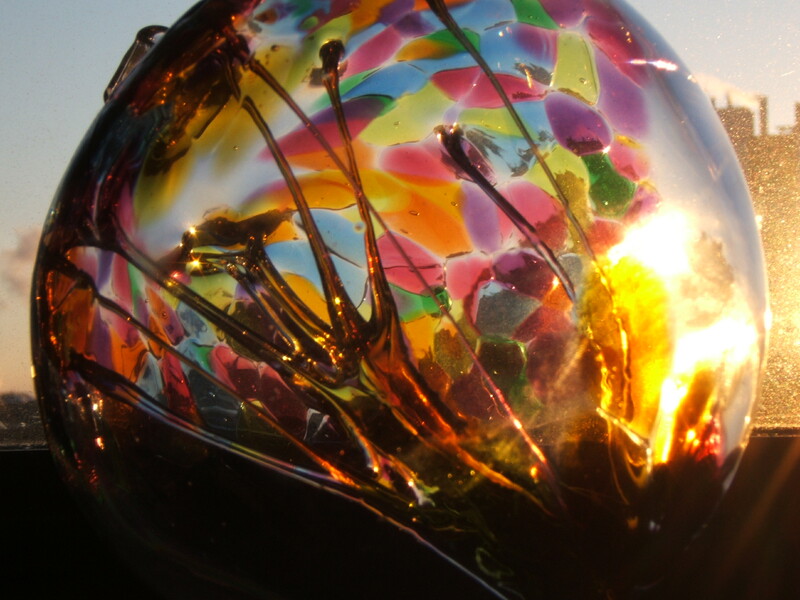 In order to make myself distinct, I used a photograph that graces the top of the blog page and has become my logo – a closeup of a hand-blown glass ball that sits on my windowsill. Through this image, there’s a bit of the skyline, including a smokestack I could always see. But now the smokestack is blocked – by a new condo building a few blocks from me. I noticed this the other day, as I took the time to look through my window at the skyline, and was surprised to not see the telltale smoke heading into the sky. I was reminded that I have experienced writing this blog – places I’ve been, people I’ve met and how my world has changed for the better. A small change in my skyline = a major change in my life, sharing my travel world. Here’s to the future – and my continuing ability to share where I’ve been with you!